PORT OF SPAIN, Trinidad, CMC – Barbados stumbled and stuttered before eventually marching to their second victory of the Caribbean Twenty20, with a five-wicket defeat of embattled Jamaica here Tuesday. 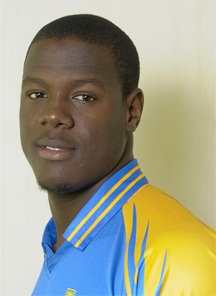 Led by seamer Carlos Brathwaite, Barbados routed Jamaica for their lowest ever CT20 score of 72 off 17.3 overs, and then reached their target off 11.2 overs at Queen’s Park Oval. At one stage, Barbados were floundering at 40 for five in the seventh over but recovered through an unbroken 33-run, sixth-wicket stand between Kyle Mayers (17 not out) and wicketkeeper Shane Dowrich (16 not out), to post their second win in as many nights and rocket to the top of the standings on eight points. Opting to bat first, Jamaica breezed to 38-0 after four overs but then suffered a shocking collapse to lose 10 wickets for 38 runs. Brathwaite was the architect of Jamaica’s demise, claiming 4-23 while left-arm spinner Ryan Hinds picked up 3-12 from four miserly overs and fellow left-arm spinner Sulieman Benn, 2-14. Opener Nkrumah Bonner top-scored with 21 but once he and John Campbell (13) were parted at the top of the order, the innings went into terminal decline. The right-handed Bonner looked enterprising early on, stroking two boundaries off 19 balls and looking to get after the Barbados bowling. Campbell stroked two fours and seemed set to change gears when he disappointingly held out to mid-on off Brathwaite. Bonner followed in the seventh over with just two runs added, stumped off the first ball of Benn’s second over and the out-of-favour West Indies spinner then claimed Danza Hyatt (2) in his next over, to leave Jamaica 42 for three. David Bernard Jr., found Shamarh Brooks’s safe hands at deep midwicket to give Hinds his first wicket at 49 for four and captain Tamar Lambert’s 25-ball labour over seven finally ended in the next over when he was trapped leg before wicket by Brathwaite. Two balls later, Aldaine Thomas edged low to Smith at first slip and Jamie Merchant also failed to score, falling to a catch at cover in the next over by Hinds. When West Indies all-rounder Andre Russell perished to a catch at slip by Smith off Brathwaite for one with no run added, Jamaica seemed dead and buried. 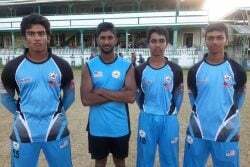 However, Krishmar Santokie banged two fours in a defiant 13 adding 21 for the ninth wicket with Nikita Miller (6), to get the score past 70. Barbados’ reply started badly when Smith was catastrophically run out in the second over for two but fellow opener Justin Brathwaite retaliated with three fours and a six in a cameo 23 off 10 deliveries. But after taking a leg-side six and four off left-armer seamer Santokie, he departed bowled in the same over, sparking a collapse that saw four wickets fall for 10 runs in the space of 20 balls. Hinds was lbw to off-spinner Merchant for six, Jonathan Carter departed in similar fashion to Santokie for a first ball “duck” before Brooks was deceived by Miller’s left-arm spin and bowled for one. Mayers and Dowrich then played sensibly to avert any pending disaster and steer Barbados to safety. Bowling: Best 2.3-0-16-1 (w3), C Brathwaite 4-1-23-4 (w2), Benn 4-0-14-2, Smith 3-2-4-0, Hinds 4-1-12-3. To bat: C Brathwaite, A Nurse, S Benn, T Best. Bowling: Santokie 3-1-14-2, Bernard 1-0-14-0 (w1), Merchant 3-0-14-1 (w1), Miller 2-0-15-1, Brown 1.1-0-5-0, Russell 1-0-5-0. Result: Barbados won by five wickets. Points: Barbados 4, Jamaica 0. Umpires: Peter Nero, Joel Wilson; TV – Leslie Reifer.